The press is asleep at the switch. Oh no, not again! Yes, I’m afraid so, as all of the reporters, editors and editorial writers who covered the recent dust-up over Colorado Senate President Brandon Shaffer (of Longmont) holding a two-day meeting with fellow Democrats unannounced and behind closed doors at the state capitol seem to have missed the most important point: This was an egregious violation of the Colorado Open Meetings law. Colorado Senate Bill 57 would require Colorado school districts to post their spending reports online. Every type of government should do this, school districts are no different, especially in light of Longmont just approving the mill levies and bond issues for St. Vrain Valley School District. You would think these districts would want to show they are trustworthy. Apparently Longmont’s State Senate Representative Brandon Shaffer either doesn’t think they are trustworthy, or you’re just too stupid to understand the minutia. He, along with 7 other senators voted against SB-57. It was already diluted prior to this vote, not diluted enough? Why would they want to keep this information secret? Rubber stamping on behalf of lobbyists Mr. Shaffer? So, all of you who voted for the mill levy and bond, and especially those that didn’t, you really have no way of knowing where or how this money is being spent if Mr. Shaffer has his way. Like I’ve said before Mr. Shaffer – those that tell you you’re doing a “great job”, don’t believe it. You’re just another political hack yes man. Anyone can do that. Thank God for term limits. This takes a while to set up, bear with me. I usually only make comments about Longmont and the local community on this website. When I want to step into the larger state and nationwide issues, it’s usually in the form of a letter to the paper. But this subject crosses over and is important, and I feel, so far, it hasn’t gotten the needed attention locally. For the most part, us “political junkie” types are the only ones paying more than a passing interest to this kind of thing. Amendment 36, or as it’s called “Make Your Vote Count” from its supporters, has a couple serious flaws with it. First, unless it’s a landslide vote in the state, the allocation of electoral votes will almost always be 5-4. That means Colorado will basically be worth 1 electoral vote, less than the District of Columbia and 7 other states that have the minimum 3 electoral votes. Talk about making your vote completely worthless. Colorado would be the most ignored state in presidential politics, and that has local and regional ramifications. The “winner-take-all” concept could be improved on, say, by allocating votes by congressional districts won. At least that could open the possibility of 7-2 or 6-3 splits, and make politicians pay attention to areas other than Denver and Boulder. To get an idea of how this might break down, I invite your readers to look at the following page on USA Today’s website http://www.usatoday.com/news/vote2000/cbc/map.htm, it shows vote by County unfortunately, and not by District. But it makes the point that if a candidate can just carry a large city or two, the rural areas can be ignored and the candidate can take the state. Is that really what we want? In reality, this amendment should be called “Make Your Vote Count – if you vote a certain way”. Secondly, and most importantly, ALL of the states would have to use this process to make it fair to ALL voters. 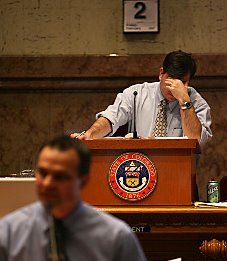 Colorado could become the unfortunate national embarrassment Florida was in 2000, as everyone waits for us to count the votes for and against this amendment, and settle the court challenges sure to follow. As much as I think ALL states should reform the allocation of electoral votes, or do away with the Electoral College system altogether if that is the feeling of the majority, this amendment smells of partisan politics. Look again at that County map, especially the West Coast states; it’s obvious who benefits from metropolitan areas deciding for entire states. At the very least, it’s disingenuous by the amendments backers to claim it’s not partisan. This is the brainchild of a Brazilian-born Californian using Colorado as his guinea pig. To use this format for California would be disastrous for his candidate. It would mean instead of winning all of their 55 electoral votes, it’d be a 28/22/5 split amongst three candidates based on the most recent poll. Colorado with its mere 9 votes is a safe place to test this idea. The anti-amendment slogan of “Coloradans Against a Really Stupid Idea”, is negative and, well, stupid. Is that the best you can come up with? I’d probably let you use my idea above. The real winner in a system like this is the candidate that receives fewer votes. Instead of zero electoral votes, he’d get probably 4. Colorado is still too close to call, so that could help or hurt either presidential candidate. This November, send a strong message that votes outside Denver and Boulder should matter. That we are not guinea pigs for others and their partisan political games. Regardless of who you are voting for, vote against Amendment 36. It’s the only way to make your vote really count. (303)866-3341 ken@kengordon.com http://www.kengordon.com ) sponsors SB07-46, a bill to once again play games with Colorado’s Electoral College vote allocation. This time around, it’s a multi-state pact where Colorado would allocate all of its 9 electoral votes to the winner of the national popular vote, regardless of how the state’s residents voted. This would only take effect if enough states signed on that equaled a majority of the Electoral College votes needed to win an election. It’s a cute way around amending the U.S. Constitution without actually going through the “hassle” of a national debate to amend it. Seems Mr. Gordon also sponsored a 2006 version of this bill (SB06-223) which died a needed death. He was on the Senate Committee on Judiciary, where he brought in some hired guns to speak on behalf of this scam, no dissenting speakers allowed here, and moved that it passed, and voted for it. A one man constitutional wrecking crew. If there’s any justice, he came up a wee bit short in his bid for Secretary of State. Oops, the voters spoke, darn them voters. All they do is get in the way. But regardless of how you feel about the idea, the bigger problem, as I see it anyway, is the way these people are trying to go around the voters. So not only are they attacking the U.S. Constitution, but also democracy and the way this republic has operated, pretty successfully overall I’d say, for over 200 years. In the article “Electoral College bypass approved”, the AP left out a little, but extremely important factoid. This scam was attempted in the 2004 election in the guise of Colorado Amendment 36, it lost 65% to 35%, that’s not really very close. Now, whether you are in favor of such an idea, or which side of the political spectrum you sit, sneaking around the voters like this should never be tolerated. It’s one thing if our “representatives” were doing just that, representing those who elected them. It’s another thing altogether to disregard 65% of the voters on a state amendment, and it’s only been 2 years. Ken Gordon’s statement “It makes every person’s vote, every human being’s vote, equal” sure sounds noble. So what about all of those people who voted against this scam? They must not be human beings, or not worthy of equal treatment. Welcome to Colorado’s, and a few other misguided states, version of democracy. Where, regardless of the voters and that little thing called the U.S. Constitution, it’s the “we know better” mentality that wins out. Our new governor has a choice to make whether to sign or veto this nonsense. Let him know what you think, although I thought we did that 2 years ago. Much to my disappointment, the House sponsor for this bill is Representative Jack Pommer (D) (303)866-2780 jack.pommer.house@state.co.us (pictured at left). I met and spoke to Mr. Pommer at a candidate forum, and even voted for him, twice. Seemed like a decent enough guy, and he shouldn’t be judged on one issue. But he obviously feels pretty strongly about it as he’s a sponsor. I feel pretty strongly about playing games with the will and voice of the voters. Just because your party has a grip on both houses and the governorship, doesn’t give you the right to pull a fast one on us. Last years version of this bill, SB06-223, was laid over (means: make dead) by request of the House’s sponsor. This years sponsor, Mr. Pommer, should follow suit. No reply to initial email. 18 preservation of the public peace, health, and safety. “SECTION 2. Refer to people under referendum. This act shall be submitted to a vote of the registered electors of the state of Colorado at the next biennial regular general election, for their approval or rejection, under the provisions of the referendum as provided for in section 1 of article V of the state constitution, and in article 40 of title 1, Colorado Revised Statutes. Each elector voting at said election and desirous of voting for or against said act shall cast a vote as provided by law either “Yes” or “No” on the proposition: “SHALL THE STATE OF COLORADO ENACT AND ENTER INTO AN AGREEMENT AMONG THE STATES TO ELECT THE PRESIDENT OF THE UNITED STATES BY NATIONAL POPULAR VOTE?” The votes cast for the adoption or rejection of said act shall be canvassed and the result determined in the manner provided by law for the canvassing of votes for representatives in Congress.”. Summary: A fellow senator wanted to strike that odd “Safety clause” and bring this to a vote of the people. Keep in mind, we already voted for something similar to this. Senator Shaffer voted NO, along with Bacon, Boyd, Fitz-gerald, Gordon, Groff, Hagedorn, Isgar, Keller, Morse, Romer, Sandoval, Schwartz, Takis, Tapia, Tochtrop, Tupa, Veiga, Williams, and Windels – all Democrats. Not one voted opposite. This group, in my opinion, stands for meaningless and questionable language in an already questionable bill, and against the voice of the voters. They not only want to ignore how you already voted, they want to go about something without giving you a chance to be heard again. Mr. Shaffer not only voted for SB06-223, last years version of this scam, but also was a co-sponsor! Form letter reply to initial email. Mr. Weissmann is the Chair on the State, Veterans, and Military Affairs Committee, which is where this bill is right now. He was on this committee last year as well for SB06-223, which is where the bill died. So far, Mr. Weissmann has been the only one to respond to initial emails, which I appreciate. There is much more on the internet about this, just do a Google web or news search using “SB46” or “SB07-46” or “Colorado Electoral College”. Here is a link to the Colorado General Assembly website, look for SB07-46 and click on the links involving it. Here are some links to articles you may or may not find interesting and/or educational. It’s a story that’s getting state and national attention. Hopefully I somewhat brought it all together for you. Now do something with it. This is not the first time this idea has come up, and probably won’t be the last. The two smiling faces above are your representatives, State Senator Brandon Shaffer and State Representative Jack Pommer (the bills co-sponsor). Mr. Pommer never even responded to my emails (or the Times-Call’s inquiries I’m told), and Mr. Shaffers aide wrote me what was not much more than a condescending form letter. Credit is given though to State Representative Paul Weissmann, who answered promptly and reasonably.